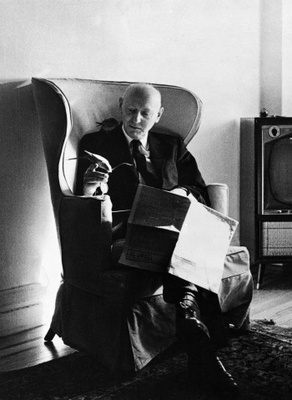 October 5th; on this day in 1978, Isaac Bashevis Singer wins the Nobel Prize for literature. Singer wrote in Yiddish about Jewish life in Poland and the United States, and translations of his work became popular in mainstream America as well as Jewish circles. Singer was born in Poland in 1904 into a long line of Hasidic rabbis. He studied at the Warsaw Rabbinical Seminar, and inspired by his older brother Joshua, a writer, he began to write his own stories and novels. He published his first novel, Satan in Goray, in Poland in 1935. The same year, he immigrated to the United States, where Joshua had already moved, to escape growing anti-Semitism in Europe. In New York, he wrote for a Yiddish-language newspaper. His mother and another brother were killed by the Nazis in 1939, the same year that Singer married Alma, the daughter of a Jewish merchant who had fled to the United States. In 1943, Singer became a U.S. citizen. His best-known works include The Family Moskat (1950), The Manor (1967), and The Estate (1969), all about the changes in and disintegration of Jewish families responding to assimilation pressures. Singer’s work is full of Jewish folklore and legends, peopled with devils, witches, and goblins. He wrote 12 books of short stories, 13 children’s books, and four memoirs. One of his stories, Yentl, was made into a movie directed by and starring Barbara Streisand in 1983. Singer divided his time between New York and Miami until his death, in 1991.